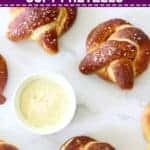 You will love this easy recipe for delicious homemade soft pretzels – how to make them at home with step by step photos and instructions – they taste just like the ones at Oktoberfest! Bread bakers! How are you enjoying the bread baking challenge so far? Let’s recap – month 1 we had No-Knead Bread – the simplest of all bread recipes and so delicious and month 2 was homemade English Muffins which were super popular. 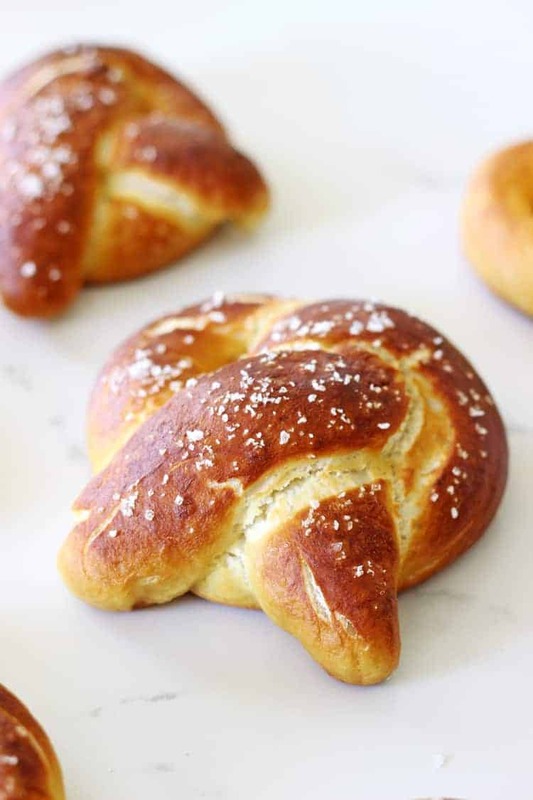 This month, we tackle Homemade Soft Pretzels. The first time I ate a soft pretzel (or bretzel in Germany as one of you has informed me) was actually in Germany at Oktoberfest. It was 2012, I was wearing a dirndl, had a stein of Hofbräu in one hand, a giant pretzel bigger than my face in the other and it kind of felt like all my dreams had come true. Since then, I’ve eaten a few soft pretzels but none have compared to the original. And I’ll be honest, these aren’t quite the same – nothing can compete with the atmosphere in those beer halls! But they come pretty close, and I think if I ate one of these with a beer, put some oompah music on Spotify and shut my eyes, I might just be back there! 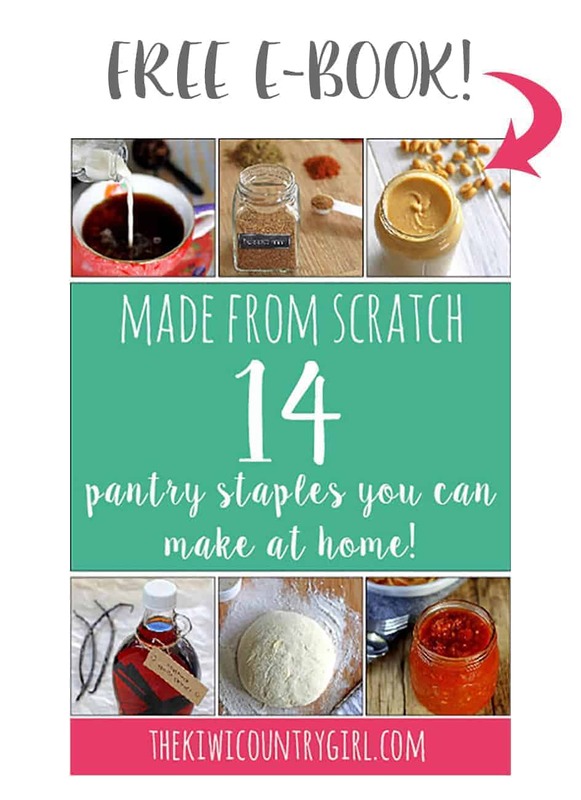 The good news is, they are really simple to make. It’s another basic dough (based on my pizza dough recipe) with straight forward ingredients. The most complicated part of the whole process is shaping the pretzels but if you look at the pictures below and watch the video, you’ll have it sorted in no time! The key in making these taste like pretzels is the quick cook in baking soda and water. It’s what gives them their characteristic flavour and brown shiny crust. That, and the generous amount of salt sprinkled on top before baking! Let’s get into the step by step instructions – the video is at the bottom of the post above the recipe card which gives a great visual for shaping the pretzels! Add warm water, yeast and sugar to a bowl, whisk together and leave until it’s foamy. Add flour, salt and melted butter and mix together until a dough forms. Tip it out onto a well floured surface and knead for about 5 minutes adding more flour if needed until the dough is smooth and soft. Put it back in the bowl, cover and let it rest for 15 minutes. While the dough is resting, heat the oven and bring a large pot of water to the boil (about 10 cups of water) and add 1/2 a cup of baking soda. Leave it simmering while you shape the pretzels. Tip the dough back on to the bench and cut it into 8 evenly sized pieces. I find cutting it like a pizza gives me the most evenly sized pieces. Take a piece and using your hands, roll it into a rope about 60cm long. Bring the two ends of the rope around to meet each other and twist over each other twice (see video or photos below for visual). Take the bottom pieces and fold them up over the top and press down lightly to seal. That’s it! 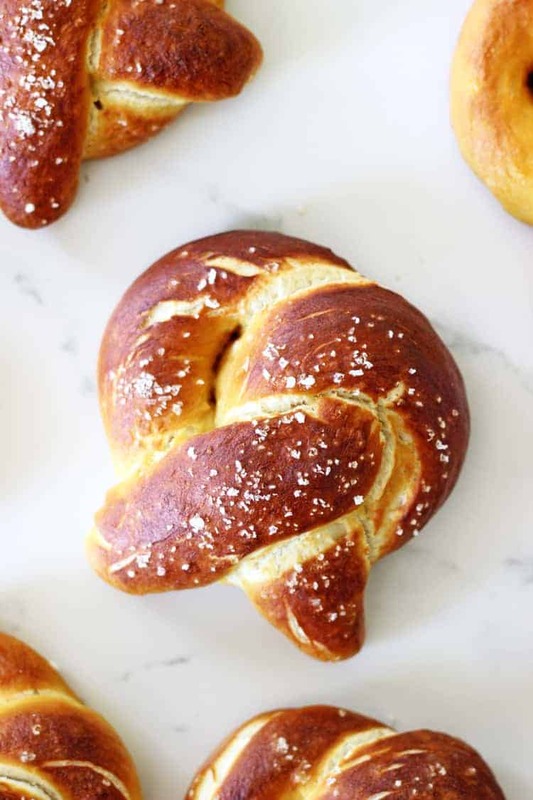 Using a slotted spoon, gently place each pretzel into the boiling water for 30 seconds. You can do 3 or 4 at a time, depending on how big your pot is. After 30 seconds remove from the water with a slotted spoon and place on a baking tray lined with either a silicone baking liner or baking paper. 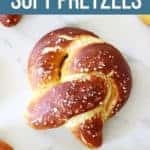 Sprinkle each pretzel generously with sea salt (I like using salt flakes) and bake for 12-14 minutes until the pretzels are a deep golden brown colour. If you are baking 2 trays at once, you will need to rotate them halfway through baking. Optional, but definitely recommended – serving with a little pot of cheese sauce! 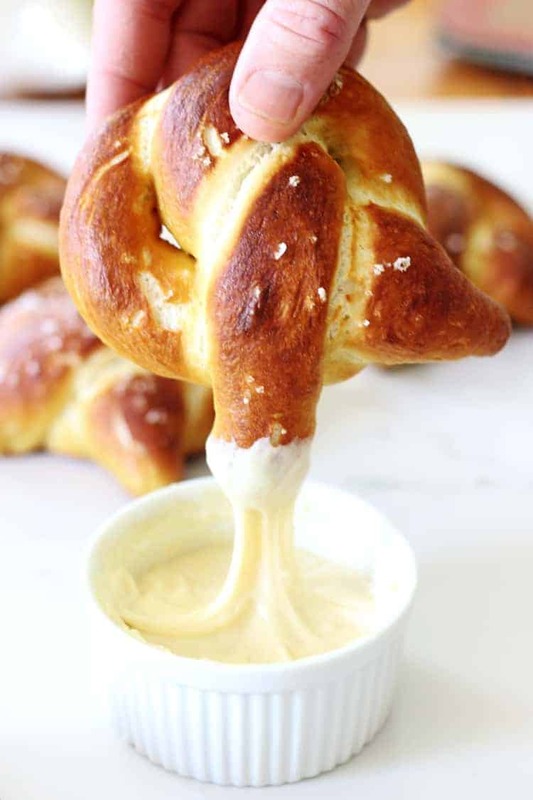 I made just a standard cheese sauce (recipe below) but added a bit of paprika and Dijon mustard which made it perfect for dipping these homemade soft pretzels in. 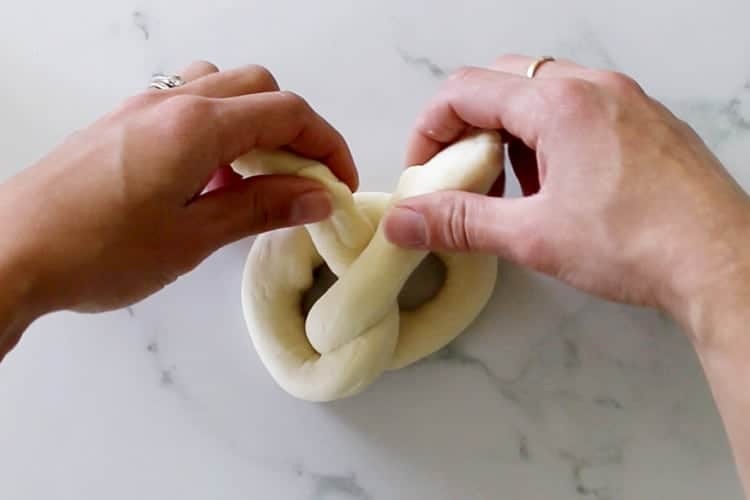 Here’s the video which will help you make those pretzels the perfect shape first time. Happy pretzel making! And don’t forget to send me a picture or share on my Facebook page if you make them. I love seeing your creations! 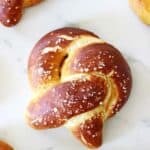 You will love this easy recipe for delicious homemade soft pretzels - how to make them at home with step by step photos and instructions - they taste just like the ones at Oktoberfest! In large mixing bowl or bowl of a stand mixer, combine water, yeast and sugar. Let it rest for 5 minutes until foamy. 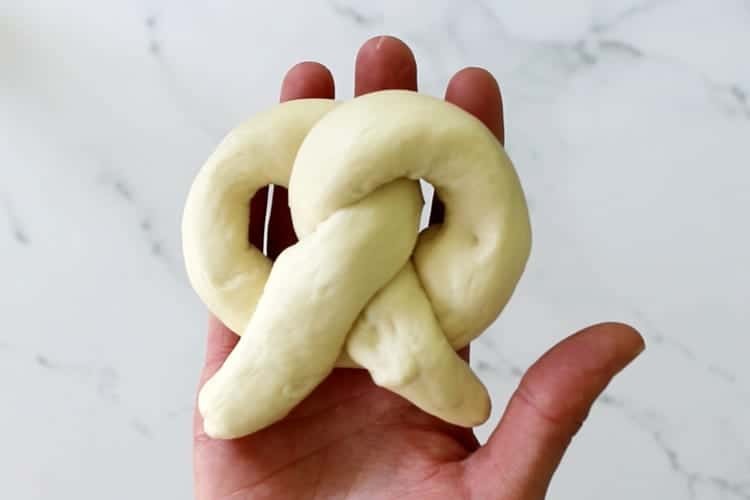 Add 4 cups of flour, salt and melted butter and mix until a dough forms using either a wooden spoon or the dough hook attachment on your stand mixer on low speed. Tip the dough onto a well floured surface and knead by hand for 5 minutes, adding the remaining ½ cup flour if needed until dough is smooth and soft OR continue to knead using the dough hook attachment in your mixer on medium speed for 2-3 minutes, adding the remaining ½ cup flour if needed until dough is smooth and soft. Shape the dough into ball and place in a large lightly greased bowl (or leave in the bowl of your stand mixer). Cover with a clean tea towel and let rest for 15 minutes. While the dough is resting, heat the oven to 230°C/450°F and line 2 baking sheets with silicone mats or baking paper. In large pot, bring water and baking soda to boil. 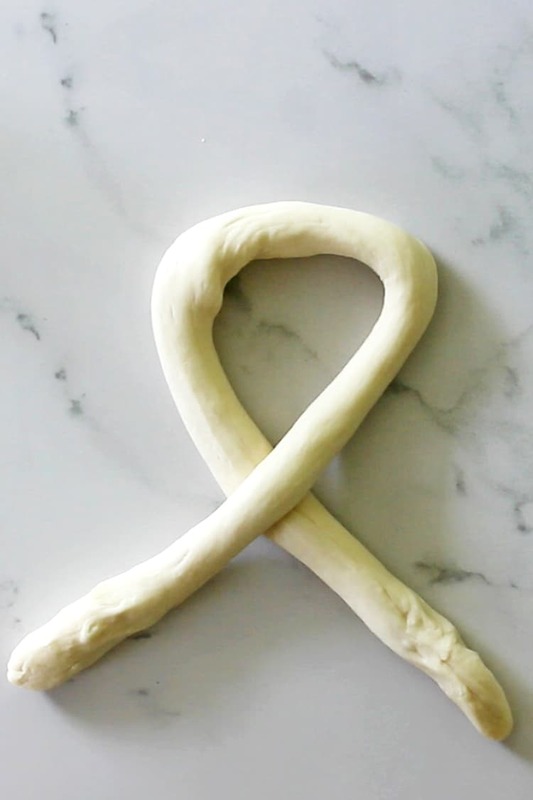 Tip the dough onto a clean work surface and divide into 8 equal pieces. 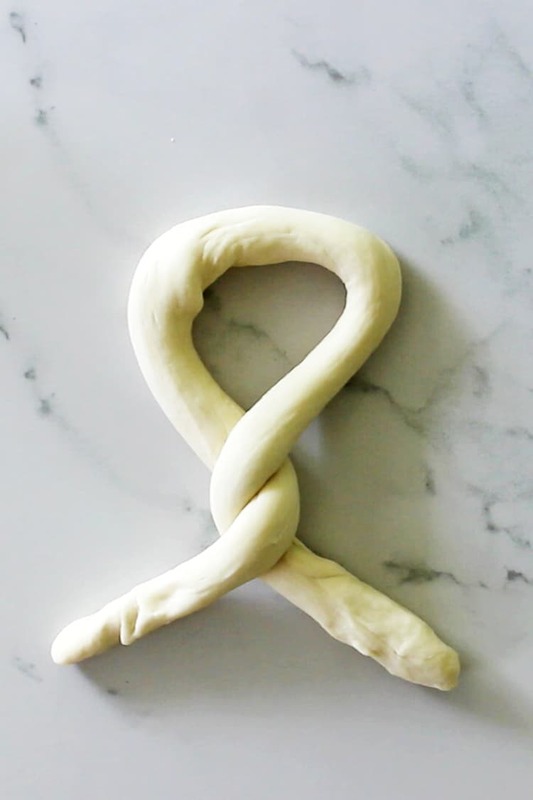 Roll each piece into a 60cm long rope and twist into pretzel shape (see photos or video in post for guidance). Using a slotted spoon, carefully dip 3 to 4 pretzels at a time into the boiling water and boil for 30 seconds. Remove pretzels with slotted spoon and transfer to lined baking sheets spaced about 4 cm apart. Sprinkle generously with rock salt. When all pretzels are boiled, bake for 12 to 14 minutes, rotating baking trays halfway through baking, until pretzels are a deep golden brown colour. Pretzels will keep in an airtight container at room temperature for a couple of days but may need to be heated before eating and are better served on the day of baking. Ahh! 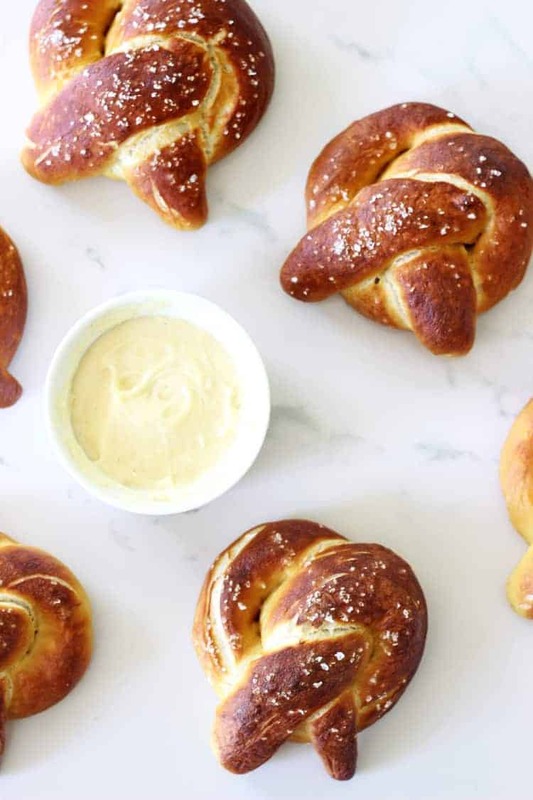 I was just craving beer cheese yesterday & just might have to make these pretzels to go with it. 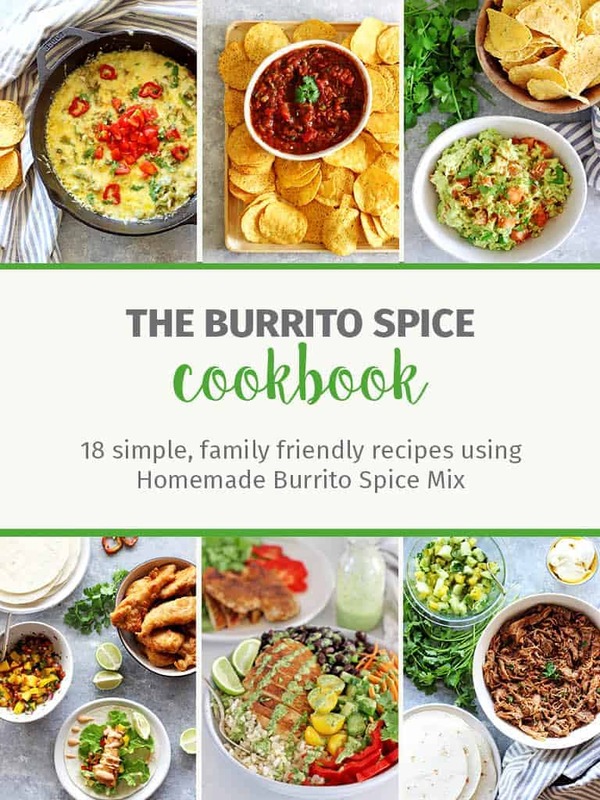 I’m so glad this recipe only makes 8. I made them on Saturday & we ate them all weekend! Ate them with beer cheese, then the next day for breakfast & that evening used them as burger buns! Thanks for this! Yay Gina! That makes me so happy to hear!